This morning I played 18 by myself and decided to track some stats after seeing another friend of mine do it recently. It was interesting to see where I gave a lot of strokes away. I played pretty well, better than I have the last couple times out. I shot 92, 45/47. Other than #10 and #11, particularly #10, I was pretty happy with my round. I feel like I am getting closer. 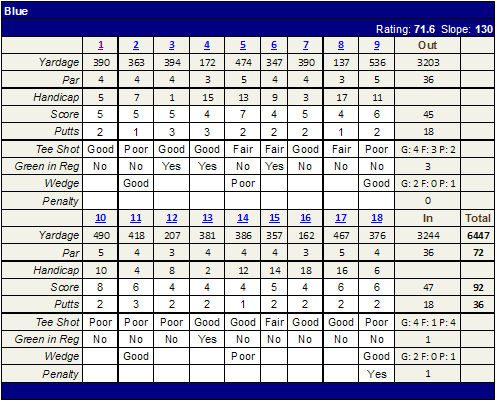 I only 2 real bad wedge shots and I putted reasonably well. As you can see below, I am not hitting many greens in regulation which means I don’t give myself a lot of chances at par or better. If I could get off the tee a little farther I think having shorter irons into the green would help improve my GIR.